Professional English in Use ICT is suitable for intermediate to advanced level learners of English. The book covers a wide range of topics on Information Communications Technology including word processing, financial software and databases, multimedia applications, email, web design and Internet security. It presents and explains new words in context and shows learners how to use them. 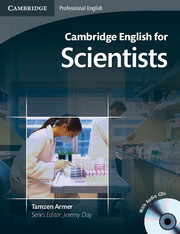 Primarily designed as a self-study reference and practice book, it can also be used to supplement classroom work. This book will be invaluable for anyone needing to improve their ICT vocabulary for work, home or study. Familiar 'in Use' format with vocabulary items presented and explained on left-hand pages and a range of practice exercises on right-hand pages. 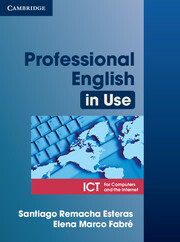 Covers a wide variety of ICT vocabulary giving learners the confidence and ability to function in English in this area. With vocabulary informed by the Cambridge International Corpus you can be confident that the language your students are learning is up-to-date and useful. Online 'You and computers' activities at www.cambridge.org/elt/ict allow learners to apply the vocabulary they learn to their own studies and working lives.